The United States may have a lot to answer for when it comes to propaganda in Afghanistan and around the world. As the Washington Post reported in 2002 in “From U.S., the ABCs of Jihad”, textbooks published by the University of Nebraska, financed by the United States government, contained strong warlike and anti-Soviet language. Primers for counting were illustrated by missiles and tanks. These books were later used by the Taliban, whose jihad was not against the Russians. Still, does the United States have to answer for family rifts loosely connected to propaganda? What about terrorist attacks? I’m not sure, and unfortunately, those are the questions that drive Gabriel Jason Dean’s “Heartland” at Luna Stage. 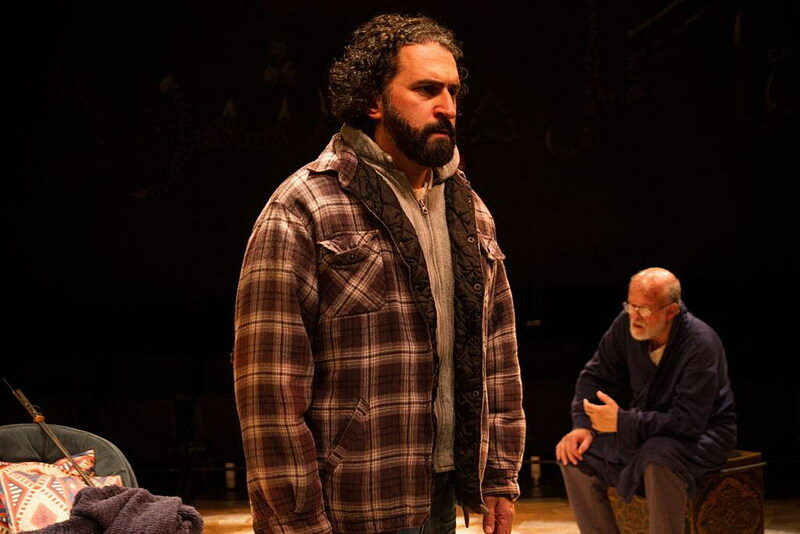 His play works when it’s about the characters, all lovable: Getee (Lipica Shah), dad Harold (Brian Corrigan), and Afghan teacher Nazrullah (Kareem Badr). But the questions feel forced. Getee, an Afghan raised in Nebraska by a scholar father, takes a teaching gig in Afghanistan for six months. There she discovers one of the dangerous primers. Then Getee realizes that her father had a hand in the books. Later, it’s implied that Harold’s book impacted the people who bomb her school. It’s a stretch — it is not the level of guilt that drives, say, the plot in Arthur Miller’s “All My Sons.” There, a pilot finds out his father made faulty engines for military aircrafts in World War II. Faulty engine, death: check. Propaganda, attack on a school much later: Maybe? In short, the stakes are too low. Overall “Heartland” feels more like a performance of guilt than real cross-culltural observation, especially during a Muslim prayer signifying forgiveness, at the end. That’s cultural appropriation of the first order. Fortunately, much of the play does not rely on the “Jihad textbook” engine. The play kicks off when Nazrullah arrives in Nebraska to look after Harold, because Getee told him she thought her father’s brain was slipping. We then alternate between the Odd Couple setup of educated illegal alien Naz and irascible Harold, and, in Afghanistan, the developing relationship of Naz and Getee. Though exposition is sometimes clumsy (at one point Getee reminds her dad that she’s 29 with a Master’s degree, apropos of little), the ensemble charm. Naz singing Miley Cyrus to force Harold to explain Existentialism delights. Shah overdoes it on the twitchy self-deprecation, but her chemistry with sincere Naz shines. Badr’s offbeat humor works every time, and feels closely observed. Other things do not: there’s a motif involving Hemingway and “The Old Man and the Sea,” and a nightmare involving a feather, that never resolve. Some details don’t track: Getee is not a Muslim (which explains why she’s so bad at wearing her head covering), and Naz doesn’t mind? Naz is an illegal alien, but when he’s offended, he can find work and a place to live? 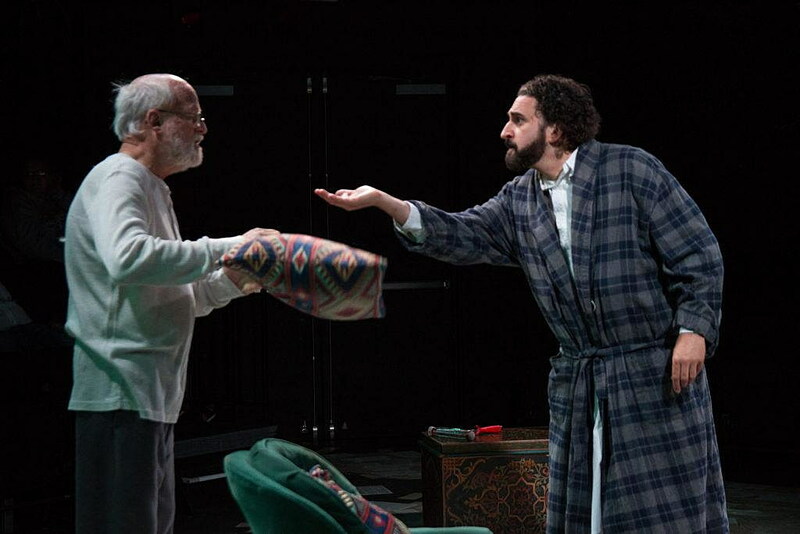 As Harold, Corrigan shows complex emotions, though seems too spry for the arthritis he tells us about. His sensible lines about hindsight succeed at making the lovers seem desperately immature. Artistic Director Ari Laura Kreith, who directs the play, gets often touching performances from the cast. 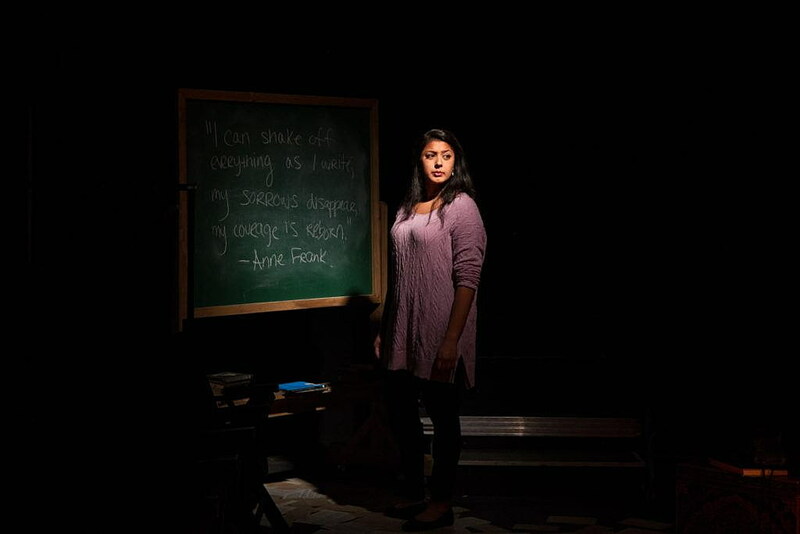 Jen Price Fick’s set design includes chalk Arabic words on the black walls of the house, with letters which are in turn made up out of English words. It’s an elegant way to support the play without intruding on it. As a family and love story, the play largely works. Kreith programmed a season of issue-driven plays this year, beginning with “Pirira,” set in Malawi. Her good intentions are praiseworthy, as is her desire to show a New Jersey audience different worlds. It would be nice to see them from truly different points of view.